How does one converse with a piece of art? Can it talk back? What does it have to say? These are the questions at the heart of The Phillips Collection’s One-on-One series, which engages artists to select a work from the museum’s permanent collection and juxtapose it with works of their own. 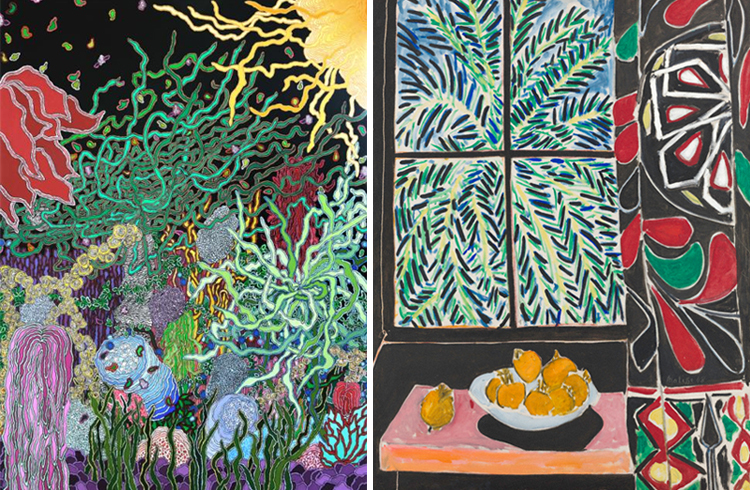 DC-based artist Carol Brown Goldberg uses Henri Matisse’s Interior with Egyptian Curtain as a source of inspiration for her current body of work. But how does one go about creating a conversation between your own work and that of a master like Matisse? She states of this exhibition, “Matisse’s Interior with Egyptian Curtain encompasses the world of the sublime, the ecstatic—an almost supernatural world of color, competition, and pattern. It is not just a world of pleasure, but one that allows tension and harmony to exist simultaneously. This ambiguity of forces, perhaps a reflection of our internal world, is an inspiration for endless gardens.” So how exactly does she respond to this idea in visual terms? It is rare that a work by Matisse is described as restrained or limited, but this is how it appears in comparison to Goldberg’s works as she expands upon the idea of Matisse as creator of a world of pattern and color. Interior with Egyptian Curtain sets the stage with the establishment of a color palette and loose, expressionistic forms. Matisse’s window gives the viewer just a glimpse of the world outside, a world of lush greenery and exoticism. It beckons, almost drags the viewer in to see more of this wild and free space, and this is where Goldberg takes over. She takes Matisse’s cue, and explodes his tease into a world where intense color and expression reign supreme. The colors are bold and match the wild, swirling forms that spread beyond the edges of the canvas, enveloping the viewer and pulling us further and further into this “supernatural world of color, competition, and pattern.” Goldberg seems to create the world that Matisse alludes to and envisions, a world in which anything and everything goes.